[PDF] Official Top Tips for Pet Paperback With CD-Rom | Free eBooks Download - EBOOKEE! Description: Top Tips for PET gives you some essential advice for each part of each of the three papers. It is written by examiners with many years ?experience of setting and marking PET. It includes: clear examples and explanations to show you exactly what each tip means. general tips for each paper to help as you revise. 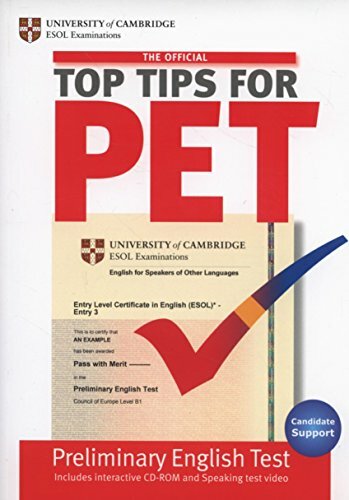 sections on how to revise, what to do on the day pf the exam and computer based PET (CB PET) The CD-ROM includes a real itneractive PET exam for you to try so that you know what to expect when you take the test. scores, answers and feedbacl at the end of the test so that you can check your performance. video of Speaking test showing real students to give you a clear idea of what to do when you take the test. After un packing the CD-ROM, you can burn it into a CD or mount the image file using Daemon tools or another similar programme. No comments for "[PDF] Official Top Tips for Pet Paperback With CD-Rom".